If you’ve heard anything about coral reefs recently, you’ve probably heard something about coral bleaching. Maybe you’ve heard about El Niño’s oceanic effects or seen before and after pictures of once colorful reefs. Coral bleaching is a real threat to reefs, and it occurs when abiotic conditions like temperature, nutrients, or exposure change. This causes corals to stress and get rid of their helpful algal tissue components. These symbiotic algae are what normally give corals their bright colors, and without them corals turn white, leading to the name coral bleaching. A before photo (December 2014) and after photo (February 2015) of coral bleaching in American Samoa (XL Catlin Seaview Survey). This blog will focus on the coral reefs surrounding the Marshall Islands, an island nation in the central pacific. 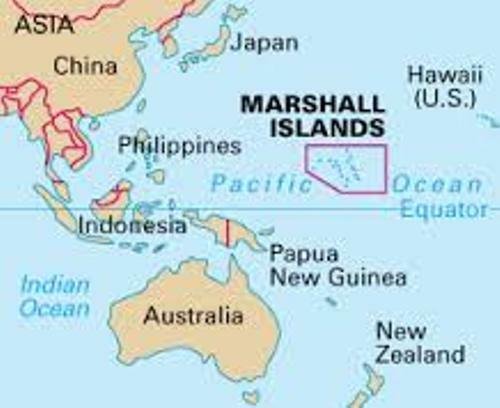 The Marshall Islands are grouped into 5 coral islands and 29 coral atolls (that’s more than 10% of the world’s atolls!). The islands are made up of two main chains—the upper, Ratak, means sunrise, while the lower, Ralik, means sunset. Although the Marshall Island’s reefs are fairly isolated and well-protected, they have still suffered some significant damage. Increasing threats to coral reefs in the area include overfishing, pollution, coral disease, and extreme weather patterns. The current major threat to the Marshall Islands is due to the latter. 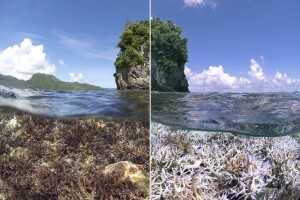 Climate change and El Niño are combining to significantly increase oceanic water temperatures, causing coral bleaching in many reefs in the Pacific. By the end of this year, it is estimated that this event will kill over 533 square miles of reef. This event is known as mass coral bleaching, and this isn’t the first time it has happened. 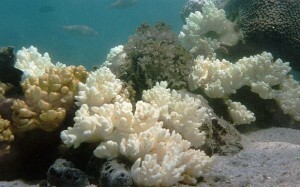 From 1997-98, sea surface temperatures rose and caused a global bleaching event. 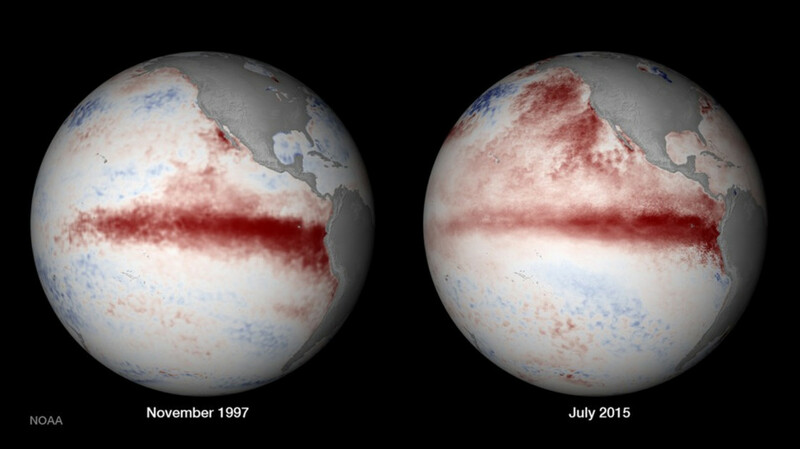 The same pattern occurred due to 2010’s El Niño event. Below, you can see a comparison of sea surface temperatures between then and now. This data shows that we are now in the midst of third global bleaching event. In the Marshall Islands, coral bleaching has already begun to impact reefs. Temperatures have been building in the island’s oceans since September, and it has been described as the worst coral bleaching to ever occur in the area. Bleached Marshall Islands coral (The Telegraph, http://www.telegraph.co.uk/news/worldnews/australiaandthepacific/marshallislands/11308173/Global-warming-blamed-for-worst-ever-Marshall-Islands-coral-bleaching.html). Experts are continuing to monitor reef conditions in the Marshall Islands and surrounding Oceania. Be sure to check back here for more updates on coral bleaching in the Marshall Islands as weather patterns continue and more information is available! National Oceanic and Atmospheric Administration (NOAA). “Coral Reef Information System: Republic of the Marshall Islands” 2015. U.S. All Islands Coral Reef Committee. 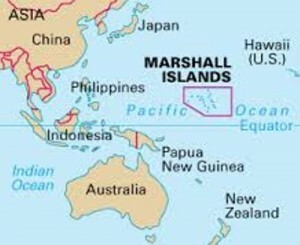 “Republic of the Marshall Islands”. http://allislandscommittee.org/aboutaic/jurisdictions/rmi/. Colarossi, J. “Massive Coral Bleaching Event is Sweeping Across the World’s Oceans”. 2015. http://thinkprogress.org/climate/2015/10/08/3710257/ocean-coral-bleaching-catastrophe/. The Telegraph. “Global warming blamed for ‘worst ever’ Marshall Islands coral bleaching’. 2014. http://www.telegraph.co.uk/news/worldnews/australiaandthepacific/marshallislands/11308173/Global-warming-blamed-for-worst-ever-Marshall-Islands-coral-bleaching.html. This entry was posted in Uncategorized and tagged atolls, Climate Change, coral atolls, coral bleaching, coral reef, Coral Reefs, El Nino, global bleaching event, Marshall Islands, oceanic water temperature. Bookmark the permalink.